Always get great pricing on spa heaters at Hot Tub Outpost. We carry name brand, factory direct heaters and spa heater parts from most manufacturers, like Aeware, Brett, Gecko, InTherm, Mr. Spa, Spa Builders, Therm Products, Hydro Quip, Balboa and Heat Wave. You can also search for hot tub heaters by spa brand - like Sundance, QCA, Emerald, Coleman, Nordic, Arctic, Vita, Dynasty, Great Lakes, Evolution Spas and others. 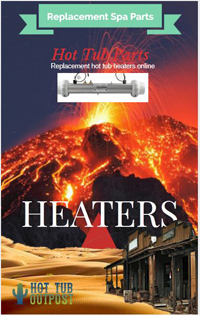 We offer replacement spa heaters for most hot tubs. Most heaters either have integrated sensors in the heater manifold, or an external pressure switch. We offer both types. From in-line heater manifolds to trombone style heaters, Hot Tub Outpost offers thousands of hot tub parts at discount prices. Get free shipping in the USA on all orders over $95. Hot Tub Outpost carries many heater parts like heater elements, housing, O rings, gaskets, heater assembly, sensors and more. One popular spa heater spare part is the pressure switch. Put teflon tape around the threads before mounting the pressure switch to the heater manifold. See the troubleshooting a spa heater page if you need to take measurements for an existing heater or want additional tips. You can also send us a photo of your heater, along with your spa brand/model, so we can make sure you order the right one. We're very helpful like that!